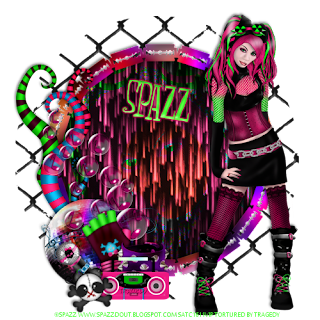 Cyber Me tube by Spazz. Get it at SATC. Emo La La Song kit by Bibi's Collection. Get it at SATC. C/P close up tube into selection. Change the layer property on the tube to Hue(L). Change the opacity on the top layer to multiply. Use your deform tool to position over the bottom of the vines. Position over the right side of the disco ball. Position to the bottom right of the disco ball. Position under the left side of the boom box. Position under the top right of the boom box. Use your deform tool to position over the left of the boom box.